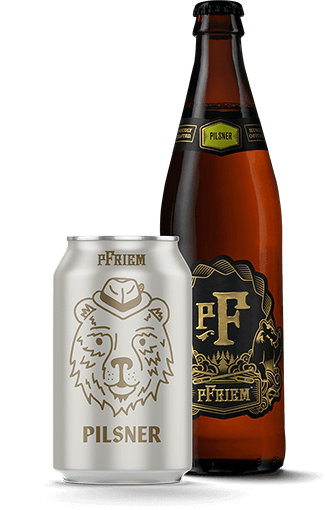 pFriem’s copper-colored Vienna Lager is a malty symphony, with aromas of toasted bread and fresh toffee, accompanied by full notes of caramel, nuts and a crisp finish with a touch of malted sweetness. Mozart would be proud. In the mid 1800’s the Viennese had something new to brew as lighter styles of beer were popping up all over Europe. Brewer Vienna native Anton Dreher has been credited as the founder of the Vienna Lager style. Anton’s father was a brewer and died when he was young, but left the boy with his brewery, barley fields, and hop fields to take over when he reached of age. Anton studied brewing in Munich and was one of the first brewers in Europe to try English style malting. He created what is now known as Vienna malt, the amber malt was stewed after the barley was sprouted, and this converted some of the malt starches into sugars, which were then caramelized by a gentle roasting. Anton used his Vienna style malt to brew lager beers that were similar to German Marzen. This beer became very popular and one point his brewery was the largest brewery in the world. Austrian’s took this style of beer to Mexico in the late 19th century where it has greatly influenced their beers. Vienna lager is a reddish-brown or copper-colored beer with medium body and slight malt sweetness. The malt aroma and flavor may have a toasted character. Our Vienna Lager is brewed with half Vienna malts creating a delicate malt aroma with a slightly caramelized and toasted malt character. Bright copper with a bright white foamy head. Aromas of toasted bread, a kiss of malt, accompanied by fresh toffee. Smooth full flavors of caramel and nuttiness. Finishes crisp with a touch of sweetness. Vienna Lager is a great sandwich or pressed panini beer. Great with delicate fish- sole, plaice, flounder, and turbot. Great with shellfish- clams, crab, and scallops. Light pasta dishes work well with oil based or creamed sauces. Pork schnitzel and weisswurst.